Apple Inc. has not reinvented the wheel with the iPad Air but the thinner device, priced higher than many of its competitors, is a major improvement on a successful product, the reviewers wrote on Tuesday. Writing for the Wall Street Journal, Walt Mossberg called the iPad Air the best tablet he has ever reviewed. "That isn't just because of its slimmer, lighter design, but because Apple boasts 475,000 apps optimised for tablet use - far more than any other tablet platform," Mossberg wrote. Damon Darlin of the New York Times said the Air is lighter than its predecessors, adding that the gadget is a delight to use. Reviewer David Pogue, who recently left the New York Times to start a new consumer-tech website at Yahoo, said the iPad Air is "a fantastic leap into the future if you're upgrading from an original iPad, or if you've never owned a tablet before." However, all three reviewers highlighted that the iPad Air is pricier than many of its competitors. "Do you need to plunk down $500 or more for an Air if you already have an earlier version of the iPad?" Darlin asked, calling the improvements on the new device "incremental, not revolutionary." Amazon.com Inc.'s 8.9-inch Kindle Fire HDX costs $379, Microsoft's Surface 2 starts from $449, while Samsung's Galaxy Tab 3 10.1-inch tablet has a suggested retail price of $400. Pogue said that given the price, an iPad probably does not need replacing every year or even every other year. 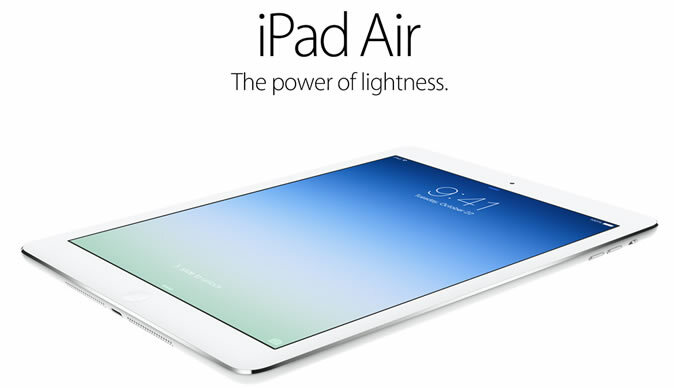 Mossberg concluded: "Bottom line: If you can afford it, the new iPad Air is the tablet I recommend, hands down." The new full-sized iPad goes on sale from Friday and will be priced starting $499.